One of the easiest fish to keep is the playful Albino Cory. 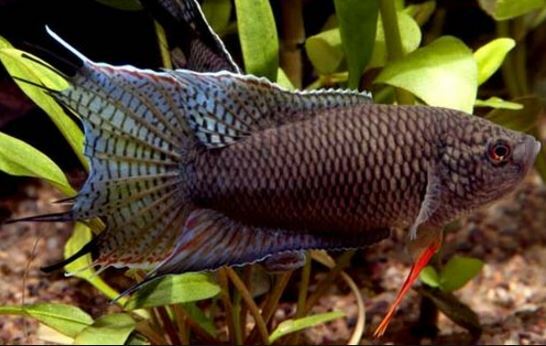 These bottom dwelling fish are hardy, peaceful, entertaining and also practical in that they will help to keep the substrate clean as they vacuum up any left over flake food or alike. Not fussy. We keep them with a gravel substrate with a few bits of rock and driftwood for some cover. Most of the time they are out and about playing in the bubbles or foraging for food among the grains of gravel. Sexing Albino Cory’s isn’t too difficult once you know what you are looking for. Females have a wider girth when looking directly overhead, more so than a male which will be narrower; females will also grow to a longer size. Unlike many other Cory’s, the Albino Cory’s are quite easy to breed. They can breed several times a year. It has been suggested to add bloodworms into their diet for several week prior, then add a tray of ice cubes to the water (that simulates rainfall) and the Cory’s go to work. Another method to stimulate rainfall is to kick the temperature up to 28ºC for a few days, then drop the temperature to 26ºC and complete a 25% water change. Albino Cory’s are widely distributed through streams and rivers of South America, they are an undemanding bottom dweller that will help to keep the substrate clean of left over food in your home aquarium. They are a scavenger, but they will not eat decomposing food and it is never a good idea to rely on them eating any decomposed food. 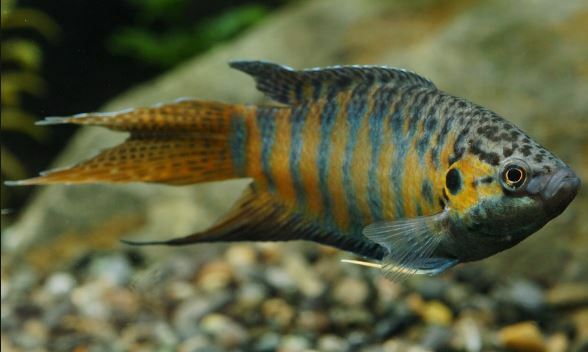 In the wild these fish prefer cooler water but can sometimes end up in a shallow pool of water. These shallow pools can become quite warm so an Albino or Bronze Cory have developed a labirynth organ and are able to survive in these pools by coming to the surface and breathing – much the same as a Gourami. 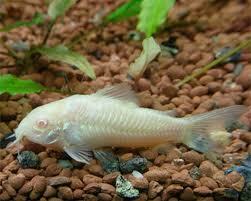 The Albino Cory is a recessive gened form of the Bronze Cory. A good point about these fish is compared with other catfish (who often hide and roam in the dark) is that Cory’s are very active when the light is on in the aquarium, making them worthy additions for your aquarium. These fish love to “play” in the bubbles excreted from the filter or air stone. It is quite comical to watch them play within a group swimming up into the bubbles – only to be pushed away by the force. It is like a playground within the aquarium for them.